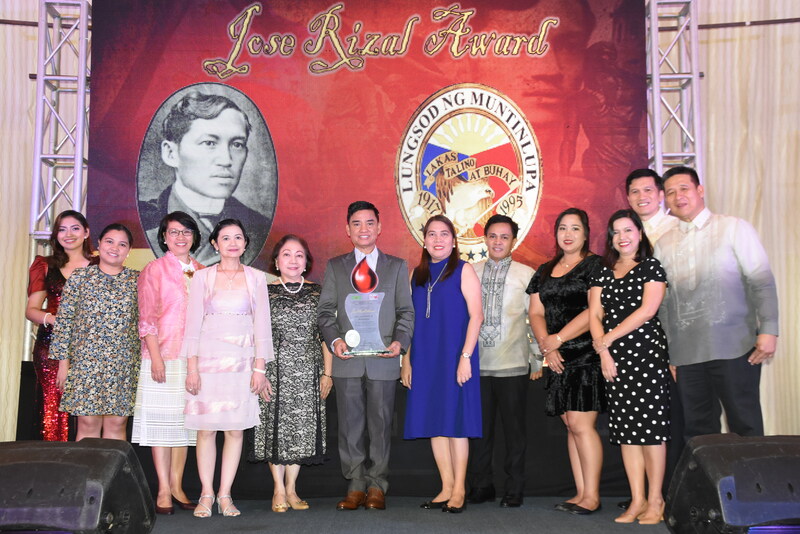 For the third consecutive year, Muntinlupa City earned the Jose Rizal Award from the Department of Health, the highest citation in the agency’s Dugong Bayani Awards. DOH lauded Muntinlupa LGU, through Mayor Jaime Fresnedi, for its outstanding blood donation services during this year’s Dugong Bayani Awarding Ceremony held at Hotel Rembrandt, Quezon City on January 25. Conferring the award were DOH National Voluntary Blood Services Program (NVBSP) director Dra. Criselda G. Abesamis, Philippine Blood Center Head Donor Management Officer Dra. Melanie Sionzon and PBC Mobile Blood Donation chief Dr. Pedrito Y. Tagayuma, and PBC officer Salvador Aydante Jr., RMT. Also joining the ceremony were CHO consultant Dra. Magdalena Meana, CHO chief Dra. Maria Teresa R. Tuliao, and NVBSP Medical Coordinator Dra. Rowena R. Tan. Jose Rizal Award is given to organizations and agencies with a collection of 2000 blood units and above. Annually, DOH recognizes organizations with significant amount of blood unit collections donated to the Philippine Blood Center. Mayor Jaime Fresnedi vows to continue the local government’s initiative in blood donation services. Fresnedi actively participates in local mobile blood donation schedules and is a Blood Galloner for 2015-2016. The local exec expressed his gratitude to Muntinlupeño blood donors for their unwavering support to the city’s blood donation programs.